Harvey Moving Back Towards Water. Significant Flood Risk for Acadiana. EVENING HARVEY UPDATE: Harvey is still a Tropical Storm with max sustained winds of 40mph over south-central Texas. Catastrophic and life-threatening flash flood emergency ongoing in parts of Texas. Our impacts are only just beginning in southwest Louisiana & Acadiana, as the system will continue to plague Texas & Louisiana for the next 5 days with a significant flash flood potential. Most of Acadiana has received 3-8+” of rain over the past 36 hours, which means soils are becoming saturated. The Vermilion River is now in minor flood stage. Pay close attention to the weather situation tonight into tomorrow. High-resolution forecast models indicating robust feeder band development across Acadiana & southwest Louisiana overnight tonight and potentially persisting through tomorrow afternoon. Gusty winds, isolated tornado potential, and intermittent heavy rain will be possible likely. Localized 2-8+ inches of rain possible where the heaviest rain bands establish themselves. The ultimate question? 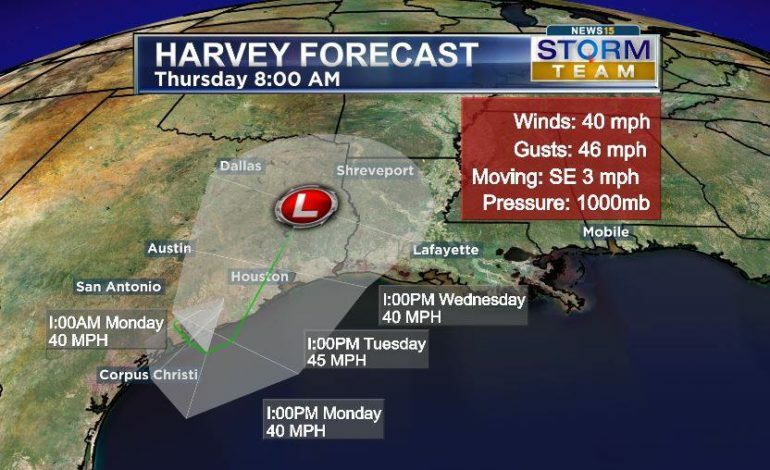 Where will Harvey move next? Reliable forecast models are STILL having fits trying to answer that question. Latest forecast models this evening continue to trend in better agreement towards a setup we don’t like to see. That includes the potential for Harvey to have a second life as it re-emerges into the northwest Gulf of Mexico by tomorrow-Tuesday. This is not good news, as that would lead to an extended duration of the system maintaining it’s status as a tropical storm. If it spends any additional time of water, it could begin to re-strengthen or maintain its intensity. The one positive is that waters in the northwest Gulf of Mexico are not as warm as they were due to Harvey “upwelling” slightly cooler shelf waters. But, the water temps can still easily fuel a strong tropical storm. After than point, forecast models still differ on how far east Harvey may get after re-emerging into the Gulf of Mexico. Most indicate a second landfall possible near Galveston/Beaumont, Texas on Wednesday morning as a weak-moderate tropical storm. A more eastern path of Harvey would place us further in the “wet and sloppy” eastern quadrant of the system. The latest National Hurricane Center track has shifted slightly east with Harvey re-emerging into the Gulf of Mexico Monday-Tuesday and maintaining weak tropical storm status. Remember, DO NOT focus on where the center of the system comes ashore. The primary impacts of rain, wind, and tornadoes will extend hundreds of miles east of where the center is located. At this point, continue to solely focus on a flash flood threat & isolated tornado potential in Acadiana today through Thursday-Friday. But, if the system does take a more eastern path, tropical storm force wind impacts aren’t completely off the table Tuesday-Wednesday. We will need to be vigilant about any bands that begin to “train” over the same locations for an extended duration day after day for the potential for flooding. The timing and location of these “training” bands of heavy rainfall will be difficult to predict, and they could set up at virtually an time! Some locations could see sunshine, while other locations 30 miles away could be seeing flooding rain. Bottom line: be prepared for a heavy rain threat for the next 5 days. Additional rainfall projections for Acadiana between 7-15+ inches within the next 5-7 days in north-central Acadiana with localized higher totals of 10-20+ inches possible(especially in Vermilion, Cameron, Calcasieu, Jeff Davis, and Acadia Parishes). Lower totals expected the further north and east you go. But, expect those numbers to continue to go up or down depending on Harvey’s exact forecast path. Stay tuned for updates.